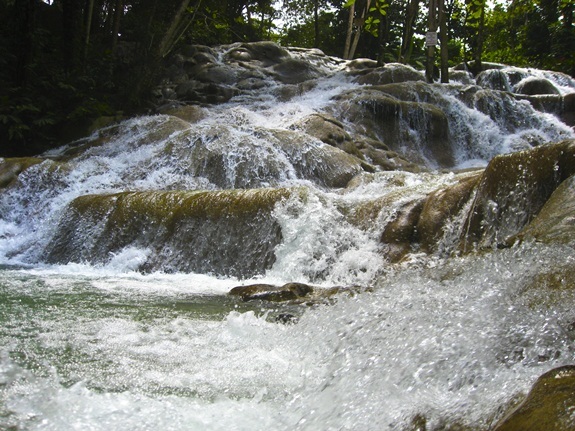 James Cameroon with all the latest CGI special effects could not concoct a waterfall more perfect than the one at Dunn River in Jamaica. 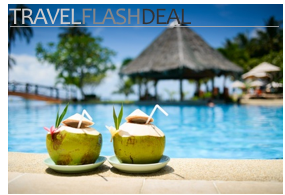 In a lush jungle filled with beautiful birds and red rhododendron, crystal waters cascade along smooth sculpted rocks until finally splashing upon a bone white beach and a stark blue Caribbean Sea. The planet has more dramatic waterfalls (Iguazu and Victoria come immediately to mind) but per square meter none may be more beautiful. And none is more crowded. 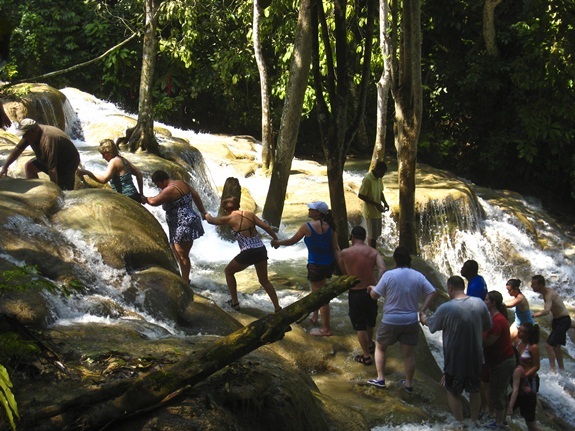 On a typical day counting the number of visitors to Dunn River Falls would easily require four figures. During the high season, and when cruise ships dock at the nearby Ocho Rios port, five figures are needed for the visitor count. 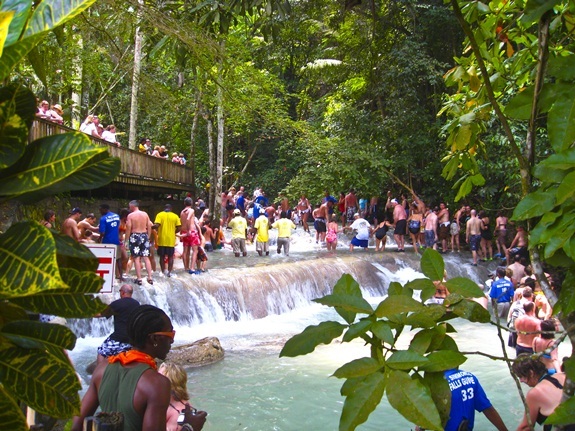 With an admission price of US$15 per person the Dunn River Falls is Jamaica’s single most profitable tourist property. The appeal, besides the beauty of the place, is the chance to climb the falls. Though be forewarned: It’s a precarious, slippy endeavor to navigate through the rushing water’s current. The way starts at the beach, a 20 minute walk from the parking lot. There climbers meet up with a guide and form a sort of aquatic conga line, holding hands to pull and push each other up. Between guides alternately yelling “You can do it, come on!” and whistling to get the attention of their stray charges, and everyone loudly milling about (many under the influence of multiple Red Stripes), the atmosphere at Dunn River is a surreal mix of boot camp, frat party and scene from FernGully: The Last Rainforest. 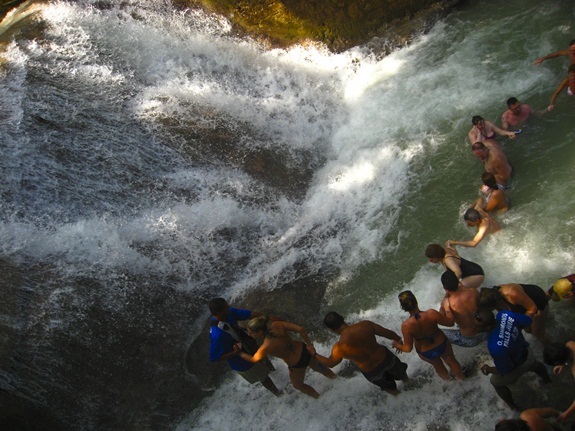 Many people who start the waterfall climb give up part way through. More than a few end up at the first aid station. But for those who make it to the top there is a real (and deserved) thrill in the accomplishment of it. 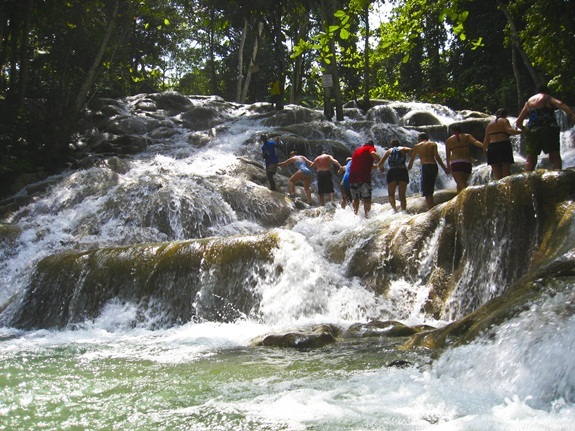 The Dunn River Falls is worth a visit even if you don’t make the watery climb to the top. The waterfalls and the chaos of the throngs trying to climb it can be observed from an adjacent paved path. Along the way are several observation platforms where you can stay dry and take in the view — if you can see over the people in front of you. If you go: For any semblance of solitude get to the gates as Dunn River opens at 8am. By rule, the climb up the falls must be made with some sort of footwear. The grippier the better. Vibrams are ideal (buy / review). A decent pair of Tevas will work too. Water shoes of dubious quality are sold and rented at Dunn River inside the entrance gate. 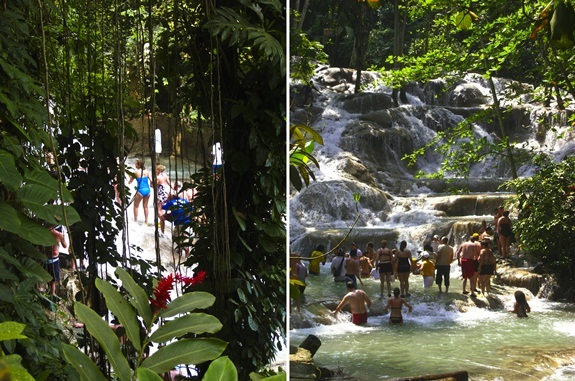 Getting there: Dunn River a few kilometers taxi ride from the center of Ocho Rios. For drivers speeding along the A3 it is clearly signposted. But the cool way to arrive is by water. 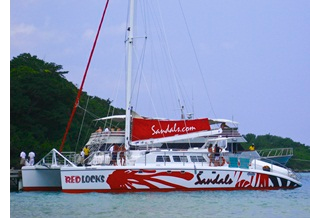 Sandals runs an brilliant catamaran booze cruise (for guests only) from their Ocho Rios properties. Several area resorts and travel agents can help you arrange more meager boat transport. Where to stay: We’re fans of both of the Sandals resorts in Ocho Rios — see our review comparing every Sandals resort in Jamaica for more info. Honestly, the crowds ruined it for me. I get what you are saying about the people watching, but that’s parks and malls are for, not nature spots. finally, an honest review of the falls. thank you!